I just got back from 12 full on days in the US-Baltimore, Washington DC and Chicago. On Thursday 12th March, I addressed a press conference in DC (at the Washington Press Club) organised by Cliff Kincaid of America's Survival and Accuracy In Media. The conference at the prestigious National Press Club focused on an unsolved 1970 bombing/murder credited to the terrorist Weather Underground-led at the time by long time Obama friends and supporters Bill Ayers and Bernardine Dohrn. 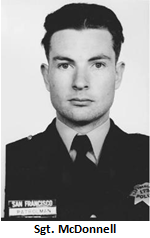 The conference called for a fresh look at the nearly 40 year old case, the February 16, 1970 murder of of 44 year old father of two, Sergeant Brian McDonnell at Park Station police headquarters in San Francisco. The FBI and San Francisco police are treating the case as live and last year arrested some former black terrorists for a possibly related bombing in the city in the same era. Sgt McDonnell was checking a noticeboard for results of police union elections (in which he was standing) when the bomb, mounted on a window sill exploded. Sgt McDonnell died of his wounds two days later. According to one of our speakers Larry Grathwohl (an FBI informant inside the Weathermen), Bill Ayers claimed to him at the time that Bernardine Dohrn had planted the bomb that killed . An FBI report from the time stated that Bill Ayers's fingerprints were found in an abandoned San Francisco "bomb factory" not long after the murder. The San Francisco Police Officers union issued a statement in support of our conference and were then told to zip it. The event which was covered by ABC, UPI Sean Hannity at Fox News, World Net Daily, Politico, News With Views, several newspapers and hundreds of blogs and websites. Cliff moderated the panel which consisted of Larry Grathwohl, Jim Pera a retired senior San Francisco policeman who was one of the first at the scene after the bombing, leading anti communist historian and researcher Herb Romerstein and myself. Larry told of life in the Weather Underground, the fanaticism and extremism he encountered and their utter indifference to the huge loss of life their abortive revolution would have produced. Larry's testimony was measured, objective and utterly chilling. Jim Pera spoke movingly of the carnage he encountered on walking into his bombed out police station. A dazed policeman wandering aimlessly with drawn pistol in hand. Badly wounded colleagues scattered across the floor. His sergeant, 43 year old husband and father lying mortally wounded with metal staples embedded in his neck, eye and brain. He died two days later. Jim was challenged by a radical talking black guy in the audience who tried to justify such terrorim because of alleged police provocation. Jim wasn't having a bar of it and let rip with an impassioned defence of his friends a colleagues. Herb presented a paper backgrounding the Weathermen's treasonous links to Cuba, North Vietnam and other terrorist and Marxist-Leninist organisations including the Puerto Rican FALN. He shattered the media myth of a bunch of passionate anti Vietnam War activists who just went a little too far. Read Herb's report here. I spoke on the re-emergence of the Weathermen-especially Ayers, Dohrn, Mark Rudd and Jeff Jones in the leadership of newly founded pro Obama coalition of radical organisations Movement for a Democratic Society. read the paper I co-authored with Cliff Kincaid here. Here's how Frontpage Magazine's John Perazzo described the event. On Thursday, March 12, the National Press Club hosted an event where several key speakers urged federal authorities to reopen an investigation into the role that Ayers and Dohrn—both of whom are former leaders of the notorious terror group Weather Underground—may have played in the February 16, 1970 murder of Sergeant Brian McDonnell at Park Station police headquarters in San Francisco. Ayers and Dohrn have always denied any personal involvement with the Weather Underground bomb blast that killed McDonnell. In fact, their consistent refrain has been that none of the thirty bombs which their organization detonated ever harmed anyone other than three fellow Underground members who were killed in March 1970, when a bomb they were constructing—and were planning to detonate at a Fort Dix, New Jersey dance attended by Army soldiers—exploded unexpectedly in their lab. But one of the individuals who spoke at the National Press Club, Larry Grathwohl—a former FBI informant who actually infiltrated the Weather Underground and held private meetings and conversations with Ayers—contends that Ayers confided to him that Dohrn had planted the bomb that took Sergeant McDonnell’s life. Brian McDonnell was another casualty of the violence practiced by Ayers, Dohrn, and their comrades. Hopefully a measure of justice can finally be delivered to those responsible for his death. And if that happens, maybe someone in the media will have the backbone to ask Barack Obama why he chose to hitch his political star to people like Ayers and Dohrn. Me I'd like to thank Cliff Kincaid for organising the event and Larry, Jim, and Herb for participating. I'd also like to thank the media organisations who reported the events and the San Francisco police officers who supported us. I'd also like to very much thank those who people whose financial support made my participation possible and my many kind and generous hosts in the US. I also used the trip to make many excellent contacts and to do considerable research, which will see the light of day in coming weeks. This trip showed me the great contrast between the best of America and its current sorry leadership. Welcome back Trevor. I hope my fellow Americans treated you with the same hospitality that Kiwi's are famous for. Did you do any touring or was the trip all business? Can't fault American hospitality Reid. I was treated very well and met many wonderful patriotic Americans. Chicago was great, Baltimore was very gracious and DC is always good. Sadly I didn't get to New York-next time? It was mainly business, but i got a little sight seeing in and a little shopping for the family. A stunning county you have there Reid. Very interesting. I'm new to your site, but it is refreshing to know someone in NZ is not drinking the BHO koolaid. I'm a USA citizen who is now a permanent resident here in NZ since 2007. I'm extremely concerned about the USA and her inelligible POTUS. From everything I've been reading, 'they' (Holder, etc) probably won't do anything to B.Ayers but hopefully they will and there can be justice. I don't expect much from holder and co, but the more truth we can get in US voters hands the better.